With races scheduled for almost one complete lap around the analog clock, the Nutmeg Classic Criterium has to be the longest day of bike racing in New England. This race could only happen near the summer solstice or there wouldn’t be enough day light. Add to that a two and a half hour drive to get there by 7:00AM and I had my work cut out for me. As the announcer, I have to be coherent all day on the mic, manage all the primes, help keep the event on schedule, and various other tasks that always seem to come up. This time I even got to play neutral support mechanic a couple of times. All this is to say – I didn’t have time (or the energy by the end of the day) to take careful notes for the blog. And the video camera never left its hidey hole deep within the back of the truck. But here is what I’ve got for you. Sorry for any inaccuracies and omissions. I am sure I have mis-remembered a few things. Feel free to correct me i nthe comments. I promise to do better next time (Mystic Velo Crit tommorrow). Despite a rather leisurely pace, the race stayed together for 15 laps until Colby Nordbloom (NHCC) tried to go solo with 5 laps to go. But he got caught at 2 to go and found a comfortable spot to sit in and recover as the field meandered around the 1 mile course another time. When the bell rang for the final lap, the field was still together and didn’t get moving until the sprint. Nessim Mezrrahi (Quad Cycles) took the sprint for first by a bike length. It was his next to last race before getting married (in two weeks) and moving to DC. Quad Cycles will miss him but some club in DC will be lucky to get him on board. Greg Vigneux (Spin Arts) was second followed by David Gilchrist (Mystic Velo). Gilchrist, the first of the finishers from the State of Connecticutt, won the pale blue Nutmeg State Games Jersey. Evan Kirk (Mystic Velo) took the sprint win ahead of Mason Chen (Chesire) and Andrew Tucker (Quad Cycles). Evan made it two Nutmeg State Games jerseys for Mystic velo. The day’s schedule was set up perfectly for those that wanted to do more than one race and the scissors were in high demand between races starting with several of the Cat 4s from the previous race. They started the 20 lap race at a gentlemanly pace and stayed together through 13 to go when back to back to back primes sprung Rob Ehrman (Vision Quest). He kept going, working the lead up to 18 seconds. Nathan Turillo (Refunds Now) tried to bridge couldn’t make it across before dropping back to the field. The field started chasing with 3 to go and Ehrmann’s lead began to drop. He started the final lap with an 8 second lead. In the last half lap the margin was just a few seconds or a couple of first downs. As Ehrmann rounded the final corner and struggled to keep his legs turning to the finish line, the field was in full gallop. Ehrmann had just enough left in him to hold off the field and win by only 2 bike lengths. The 55 plus and 65 plus fields raced at the same time with a 1 minute gap at the start. Unfortunately, it didn’t stay that way and keeping track those off the front and the back got a bit confusing. The lead groups of three in both races stayed separate, but the fields got mixed together. This wouldn’t have been a big problem except that the lapped riders caused the race volunteers to miss ringing the bell on the last lap. But these are gentlemen and the three gentlemen in each lead group decided on the road to ride one extra lap and have a proper sprint. Clarence Ballard (Somerset) won the 55s with Turgut Baliki (CTS) and Thomas Cormier (NHCC) right behind. In the 65s it was Ed Lang (NEBC) outsprinting John Auer (Somerset) and David Burnette (Mystic Velo). After several small breaks were launched but couldn’t stay away, Stephen Gray (Bethel) won this one with Aubrey Gordon (Liberty Cycle) and Paul Curley (Gearworks) right behind. Patrick Ruane (Sunapee) took the win with a solo break. Patrick Ruane won his second race of the day coming out of a break of ten for another victory. Patrick Ruane sat this one out to save a match or two for the pro race. This was a super aggressive race with lots of little breaks noodling off the front but the field wouldn’t let anything stick. Paul Richard (CCB) took the victory. All the 20 mile races (30plus Cat 4/5, the Cat 4, the Masters 35 and the Masters 30) finished within 43 to 44 minutes. I would have epxected the Masters fields to be noticeably faster than the Cat 4 and 4/5 fields. The field had to wait on the line for a few minutes before the start. In the mean time, I got a little bored so I decided to give them a first lap prime while they were waiting. I announced it on the line and rang the bell as soon as they were told to go by the oficial. This strung the field right out. Morgan Hiller (CLNoonan) took the prime then the race settled in to a more normal cadence. But soon the primes came fast and furious and lap times dropped to 2 minutes (30 mph on the 1 mile course). The large field of 70 or so wound it up and raced super fast in this race. Morgan Hiller busted a spoke toward the middle of the race and came in for a replacement which his younger brother got for him. He got back in before the free lap rule ended and found his place toward the front of the field. In the final sprint, Sergio Atocha (GS Gotham) took the sprint ahead of Hiller (CLNoonan) and Jurgen Neblong (Base 36). Worthy of note, 58 year old former Olympian for Trinidad and Tobago, Patrick Gellineau (Team Squiggle), finished a very respectable 6th after already taking two 5 places and an eighth in the Masters races earlier in the day. These two groups raced as one pack of about 25 with separate prize lists. At the finish Rebecca Wellons outsprinted her NEBC team mate, Brook O’Connor. A couple of places back, Steph Chase (IBC) took first place in the 40plus. A big field of more than 70 riders lined up eager for primes and prize money totaling well over $2000. Regional powerhouse teams from New England and New York were well represented with the notable absence of Robbie King and his Indy Fab squad. The racing came fast and furious with lap times occasionally going under 2 minutes (over 30 mph). After awarding 8 $100 primes, the field was strung out heading into the final laps but no move could make a lasting impression. That is until Craig Luekens (CCNS) and another rider (sorry I don’t have the name) established what looked like it could be the winning move with an 18 second gap. But with 4 laps to go CCB moved to the front and began an organized chase. Three and sometimes four CCBs dragged the field along, apparently without much help. from the rest of the field. They absolutely buried themselves to catch the break. Meanwhile, a series of crashes marred the final three laps with a few riders being taken out in each one. One of the riders later explained “people were sticking their wheels where they just didn’t belong”. With only a couple hundred yards to the line for the finishing sprint, the CCB train caught and passed the 2 man breakaway at full gallup delivering their designated sprinter to the line with a clear shot and a full head of steam. It would be Colin Jaskiewicz’s day in the spotlight after the self less work from his CCB team mates. Those team mates included Will Dugan, Aliaksandre Bialiauski, Yahor Buben, and Dzmitri Buben. Dugan and Jaskiewicz are team mates at UVM as well as at CCB. Jaskiewicz is the current national collegiate criterium champion and Dugan is the national road race champion. Through in Jamie Driscoll, UVM’s collegiate Cyclocross champ, and you have an impressive school cycling team. Women 3 and Women 4 raced together in one field with separate prize lists. 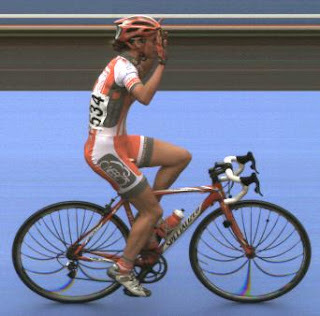 Although there was some confusion at the finish when some of the women couldn’t see the lap cards, Frances Morrison (Mount Holyoke College) won the Cat 3 race and Pan Xieyuel (CRCA) was the first of the Cat 4s. I am sorry I don’t have more details on this race, my memory of that one is just a blur. After early rains soaked the first few races of the day, race promoter Bill Humphries (aka the Bike Guy) got the weather he was hoping for. The skies dried out followed by the roads and a great day of racing was had by all except the Cat 5 field that had to race in the pouring rain. One of them even had a flashing red tail light on his bike. The race schedule included all categories and most age groups but this report is going to be brief and limited to just the feature race of the day, Men Pro 1, 2, 3. Many of the same riders who had competed the previous day were also present for the Whalng City Cyclone with the addition of the Independent Fabrications Team lead by last year’s winner Robbie King and Team Fuji lead by former national pro road race champion Mark McCormack. The CCB (Cycling Club of Basingstoke) was present after their win at the Nutmeg Classic the previous day. With the prime bell going off frequently the speeds were high on this technical 6 corner course and the field was often strung out single file. Around half way through, Robbie King (Indy Fab) took a prime and kept going. This drew out Amos Brumble (CCB) and Ron Larose (CCNS). Dylan McNicholas (CCB) quickly joined giving CCB the tactical advantage in the break. With the two strongest teams in the race represented in the break, the blocking started and the lead group established a solid gap that approached half a lap of the 1 km course. At one point the gap came down a little bit and Will Dugan (CCB) jumped across to join his two team mates in the break giving CCB 3 out of 5. Robbie King kept sprinting for the primes, maybe realizing his chances in the finish were slim, and winning them. With 6, 5, 4, and 3 laps to go everyone in attendance who knows anything about tactics was wondering when CCB would begin to use their numerical advantage against Robbie and Ron. It was not until the final lap or so that the three CCB riders started attacking and making the other two chase. Larose cracked after one CCB attack but dangled in no man’s land long enough to take 5th place. The second attack went and King covered again. Heading into the final corner, CCB made their final move hoping that King was spent but he countered and blasted into the lead going up the uphill sprint. Dugan stayed right with him. Despite having been off the front for almost half the race, taking most of the primes from the breakaway, and covering strong attacks from McNicholas, Dugan and Brumble in the last lap, he held on to beat Dugan to the line by just inches. That’s two for two for Robbie at Whaling City. Robbie said after the race that he was glad Will wasn’t a little taller; he might have won with a bike throw. It was that close.